EPS FORMAT FILES ARE FOR TRAINED GRAPHIC ARTISTS AND CANNOT BE OPENED IN MS OFFICE PRODUCTS. Use the JPG or GIF files if you are placing the graphic on a web page or in a MS Office Product (such as MS Word and Powerpoint). PNG Files: 500 pixels wide, contain transparency, good for Microsoft products. JPG Files: Does not contain transparency, good for web and/or Microsoft products. DDI Logo with Tagline 1 -- "Metadata powered by DDI"
DDI Logo with Tagline 2 -- "Data Documentation Initiative"
DDI Logo with Tagline 3 -- "Member of DDI Alliance"
DDI Logo with Tagline 4 -- "Document, Discover, and Interoperate"
These guidelines specify permitted uses of the logo in its various forms. DDI makes a simple double-sided handout available for distribution at conferences and meetings. Can be printed on 8-1/2 by 11 paper. DDI makes a tri-fold brochure available for distribution at conferences and meetings. Can be printed on 8-1/2 by 11 paper. All details needed to submit to a professional printer are in the zip file. Specifications; Tri-fold brochure; Flat sheet size: 8.5"x11", finished print size: folded to 8.5"x3.625"; Paper description: 100# white glossy text paper; Double sided/duplex head to head, parallel fold; Full CMYK color; Score folds). 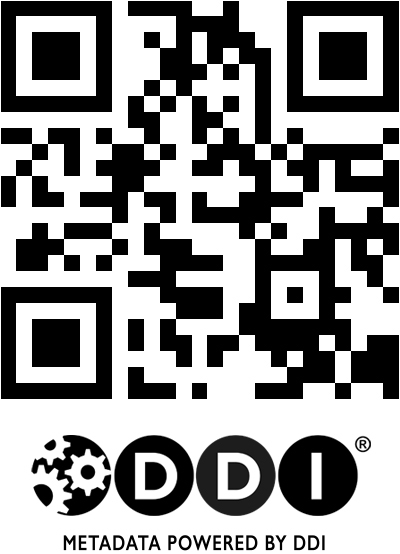 This QR code stores the URL of the DDI Alliance website, www.ddialliance.org. A QR (Quick Response) code is a type of barcode that can be scanned and deciphered by many mobile phones. When a mobile phone that is equipped with a camera and QR code reading application scans the code, the device will open a web browser and display the DDI Alliance home page. The DDI Alliance QR code is provided as a high resolution JPEG file so that it can be easily integrated into any type of printed materials from brochures to posters.